Yoga is something that I'm proud to say I've been practicing for quite a while. My mom started teaching me simple stretches and moves when I was about 10 and by the time I was 15 or so I was coming to her class with her once a week. It was always something that helped me bond with my mom, because we both enjoyed having an exercise that was not only healthy but also had a spiritual element. Even though I was a bit of "teenager" about it at first and didn't get really into it, after a couple years of doing it I really started to get the hang of it and felt a deeper connection to it. However yoga has also been one of those things that I started to practice on and off, due to my schedule getting busier and sometimes having lack of motivation. But there was one feeling that I never really felt when I did yoga, which was self-consciousness. And I think this had a lot to do with me having good instructors and going with good people, along with getting to a point where I was just focusing on the feeling that yoga gave me, instead of worrying about how good or bad I was at it. I usually went with my mom, my old friend and her mom and we all just had fun with it and ended up taking a lot out of each class. The instructors I've had were also always very calm, understanding and always highlighted the idea of being in the moment and thinking of your own body and practice with no judgement. In addition, if the best thing for you is to go to a class with no one you know, or eventually just do it by yourself at home, that's totally fine too. I usually prefer classes for most exercise routines because I need to work on my self-discipline, but I eventually really liked doing it alone, depending on what I want to get out of my practice that day. The whole point of yoga is to make yourself calm and cut out negative energy, so make sure you're environment makes you feel comfortable and at peace. There are so so many different types of classes you can try to mix things up. Eventually it's good to get into a steady routine, but there's nothing wrong with going to some unique classes. I usually suggest to people who say yoga isn't there thing to try outdoor yoga in the summer, because it will definitely change your mind. I remember last summer my friend and I went to a free yoga class that incorporated TWERKING, and even though it might not be a type of session that I attend regularly, it still was super fun and it felt great to be able to improvise with different moves that I've known for years and years. Hot yoga is something that also is amazing either in the summer or whenever you get a chance to do it, it really feels amazing after you're done, like you released all of your stress and anxiety via sweat. I also have heard great things about arial yoga that I am DYING to try very soon. Whether you're an extrovert who wants to go with friends to yoga classes, or love being alone, i think everyone should get into an at-home yoga routine if they can. Even if it's just a couple moves in the morning right after you get out of bed or in the middle of the day during your lunch break. The best way to have a good practice at home is to just keep a simple template for routine that's maybe 4 or 5 moves that you repeat for 10 minutes or so. And then if you're feeling more up to it you can do something a little more advanced (I'll link some tutorials below). My favorite quick routine is called Sun Salutation (see below) but I do a variation of it in the evening as well! My friend once gave me this little diagram and I put it up on my wall and it's the main thing that has reminded me to keep up my home routine. It's simple and easy to memorize, and for the overthinker that I am, it's just the thing I need. One of the most important things about yoga is the breathing. This can sometimes be harder to focus on than it seems. I've experienced this a lot when I was starting out because I felt like I was focusing too much on doing the moves right, and not just zeroing in on my breath and body. Involving smells and aroma definitely can help with this, and it's something I utilize for meditation sessions as well. I truly think aromatherapy is something that helps immensely for stress and staying focused when you're doing anything. 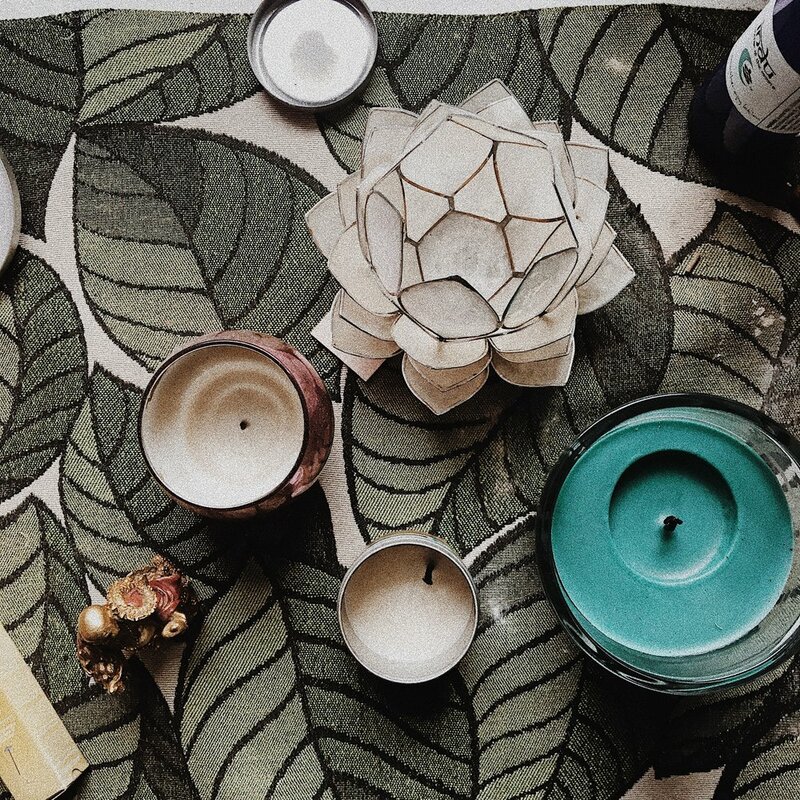 One of my biggest issues with staying with my yoga practice is that I get distracted easily, but using aromatic things helps me stay in the present. I recently got the Balance and Breathe candle from Anthropologie, which I use for my evening practice and is perfect. Then when I do a more intense practice I like to use incense because it has a stronger smell that helps me stay focused and in the moment. In addition, one of my favorite lotions to use is Indu, that my mom had passed down to me. It smells amazing and my old yoga teacher used to have us use it during the final Shavasana (meditation). Lotions like that can be an amazing way to end your practice in a calm and relaxed way. I also recently bought a little essential oils diffuser and its a life saver for meditation if you don't feel like burning any candles. I always feel like I get the most out of my meditation right after a good yoga routine. Right after I'm all stretched out, a little tired and can focus on my body and breathing. I feel like your whole yoga practice should be a time to be mindfull in itself -- that's why it's so important to get that idea out of your head of how "good" or "bad" you're doing or how you look, what you need to do afterwards, etc. That's why ending with meditation is my favorite part of the practice. Partly because it's the time I get to stop moving...but it's also the part where I feel like I completed a spiritual practice and not just a chore. It reminds me that what I did was for myself and only myself, and that's when the results really start to feel worthwhile.